There’s no holiday quite like Purim. From the costumes, to sounding the graggers during megillah reading, to the Talmudic commandment to drink as a way of lifting our spirits closer to God, there’s no other celebration that’s as outwardly – and inwardly – festive on the Jewish calendar. 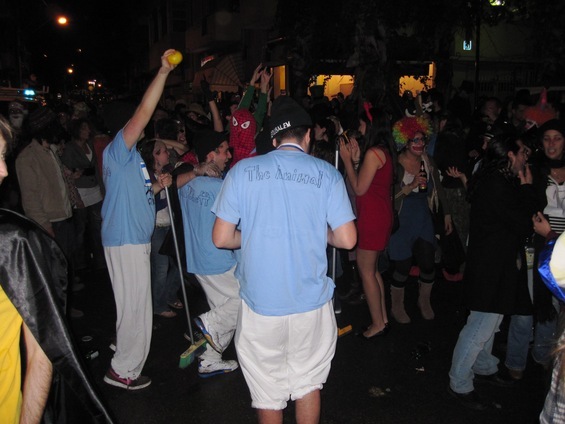 Having never been in Israel during Purim, many of us on Otzma were determined to celebrate it in style. We heard about the annual street party in Tel Aviv’s Florentine neighborhood that always draws a big crowd and decided to check it out. While the forecast predicted heavy downpours for Saturday night, the rain stayed away for the entire evening, and thousands descended on the street party extraordinaire that had the feel of a Jewish Mardi Gras. Yours truly went as a pirate, and my fellow Otzmaniks dressed up as everything from Aladdin to cowboys to the ridiculously trashy cast of the Jersey Shore reality show (incidentally, the real life Snooki and Vinny attended a Purim party last night in Manhattan). Sunday afternoon was for the kids – Dizengoff Center was filled with families and children in all sorts of costumes (by my informal count, the most popular costume among young kids was the Na-Nachs, a sect of the Breslov Hasids who wear big white, knitted kippot). Inside the mall, there were games and mini-playgrounds set up for the kids, and the middle schoolers shopping and eating were also decked out and dressed up. While the events of the Purim story took place thousands of years ago, there are still Hamans in the world today who are openly and vocally plotting the destruction of the Jewish people. Just this past weekend, the unholy triumvirate of Mahmoud Ahmadinejad, Hassan Nasrallah, and Bashar Assad had a get-together in Syria full of the usual rhetoric, once again reminding the world of their dangerous intentions, and the Jewish people of the continued existence of Amalek. But just like the Jewish people survived Haman’s original Purim plot, and the countless incarnations of Amalek ever since, we will continue to live eternal, the ultimate miracle of God’s Covenant with us as His Chosen People.